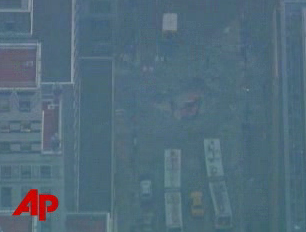 Earlier today a steam pipe exploded in midtown Manhattan on 41st & Lexington, killing one and injuring others. This death toll is amazingly low considering the pipe exploded around 6pm, high rush hour, right next to Grand Central Station – one of the busiest parts of New York for commuters at this time. It’s amazing to see the images of the steam escaping, and to think that these pipes are under most of Manhattan. To me it raises the question of whether this steam driven system is appropriate any more, but then people die each year from ice falling off sky scrapers, or even electrocution from drain pipe covers! You can see from the image above the size of the hole that was blown in the road when the steam escaped. Other images in the footage at BBC news show the steam reaching to midway up the Chrysler Building nearby.